A Cold Hole at MASS MoCA. Entering the exhibition space at MASS MoCA we encounter a large, closed off gallery. There is a door above what proves to be a wall hugging horizontal refrigeration unit. A guard informed us that one enters to the left under the stairs. It takes a few minutes to become oriented to a vast space, dimly lit, and upholstered floor to ceiling with dark, sound and light absorbent material. During the opening celebration there was a dense mass of visitors at the far end jockeying for a view into an eerie glowing space featuring a thick square of ice. For the installation piece “A Cold Hole" the artist Taryn Simon replaced the gallery floor with solid ice, topped by a five-foot-by-five foot hole. It invites the embracing potential of a brief Arctic experience. Participants must assert in writing that they are 18 years of age or older, capable swimmers in good health, and agree to have the event documented. The coordinator will contact applicants to review and confirm your appointment. Please click here to sign up for A Cold Hole. As Harry Houdini found out, much to his demise, things can go terribly wrong with water based stunts. Yes, folks, art can kill you. Not that this is anything new. The late performance artist Chris Burden liked to push the limits. He had himself shot as a work of art and invited individuals, having signed disclaimers, to have similar experiences. Rituals involving freezing water pervade centuries and cultures. It was prescribed as a “cure” for the utterly mad King George III. He was alternately immersed in boiling water then an ice bath. The notion was to shock the poor monarch to his senses. Trying to get a glimpse of the cold room which made little or no sense to me I returned to the reception for a beer and snacks. Then there was an enormous commotion of which I experienced only the aftershocks. 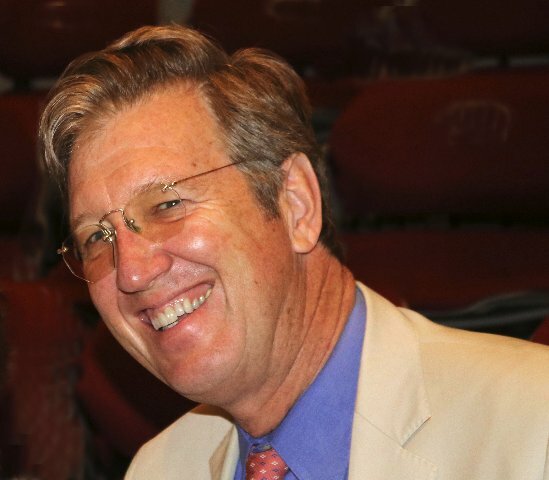 Interacting with guests we had noted the handsome and charming Joe Thompson, director of MASS MoCA, typically attired in an impeccably tailored, ultramarine blue summer suit. To the utter delight of first-nighters there was boffo applause when fearless Joe took the plunge. Yesterday, while attending a media event at Shakespeare & Company, we were seated next to him in the Bernstein Theater. I asked whether he planned to jump into the frog pond next to the theater. With charm and humor he recounted his frigid adventure. While putting links in his French cuffs that morning he noticed that they were black squares. 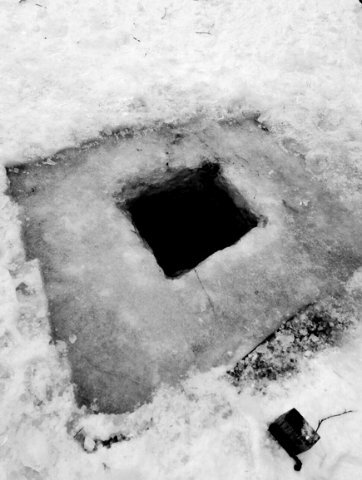 Perhaps, like the Ides of March, it was an omen of Simon’s Cold Hole. It seems that Thompson was not the first, but arguably so far the most renowned and dramatic, to take up the artist’s challenge. There were a number of technical and safety issues to deal with. Staff volunteered for some ‘wet’ runs. What became of that gorgeous suit I wanted to know? The answer came as quite a surprise. After the stunt he had changed clothes and rejoined the vernissage. When he went to get it the suit, shoes and shirt were gone. He speculated that someone, perhaps an intern, had done a solid and put it away somewhere. Several days later it was found in the Hunter Center dressing room. It was starting to stink. What about the shoes? Thompson is always well shod. He was pleased to say that available slots are disappearing. A surprising number of folks are eager to add performance art to their resumes. “Have you looked at her books?” he asked. There are a couple of galleries with vitrines displaying a number of artist books. The installation includes all of Simon’s bookwork to date, from The Innocents (2003) through An Occupation of Loss (2018). Joe provided a fascinating insight about one of them. James Bond (January 4, 1900 – February 14, 1989) was a leading American ornithologist whose name was appropriated by writer Ian Fleming for his fictional spy James Bond. The real Bond was born in Philadelphia and worked as an ornithologist at the Academy of Natural Sciences in that city, rising to become curator of birds there. The artist researched the films and created a coffee table book of all the birds that appear in the series of James Bond films. On a rainy day we will go back for another look. But, no way Jose, do I plan to take a plunge into the artist’s work. That I leave to mad monarchs and museum directors. "Art is anything you can get away with, said a sage. So is running a museum, sez I." "You want cold, move to Antarctica. I don't know if Joe needs a neurosurgeon or a PR medal for stunt of the year."